Ever since I painted the little bathroom under the stairs, I've been looking for some art to hang in it. This used to be a dark place that I avoided. Now it is bright and happy, but one wall needed something pretty. Finally, inspiration struck me. 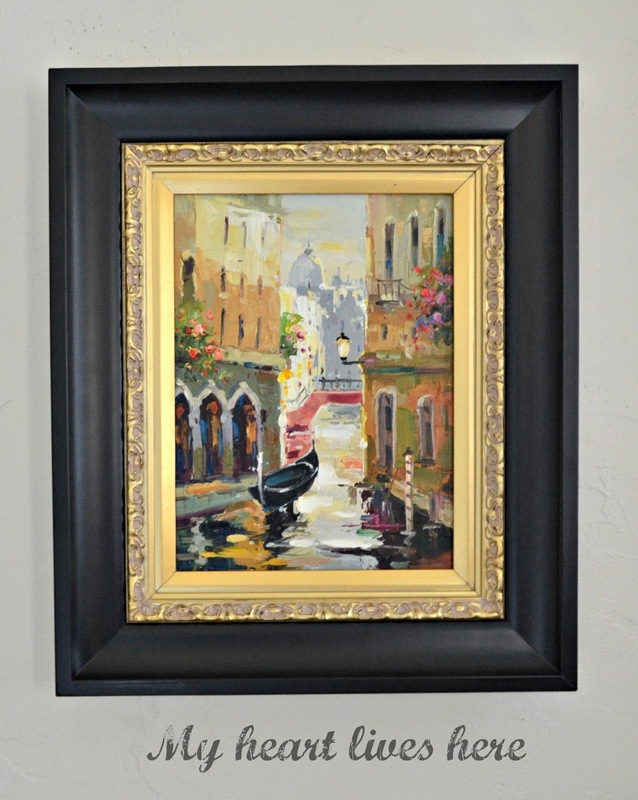 I've had this lovely picture of Venice in our dining room. Shopping your own home is always rewarding! Originally, I found this piece at HomeGoods. 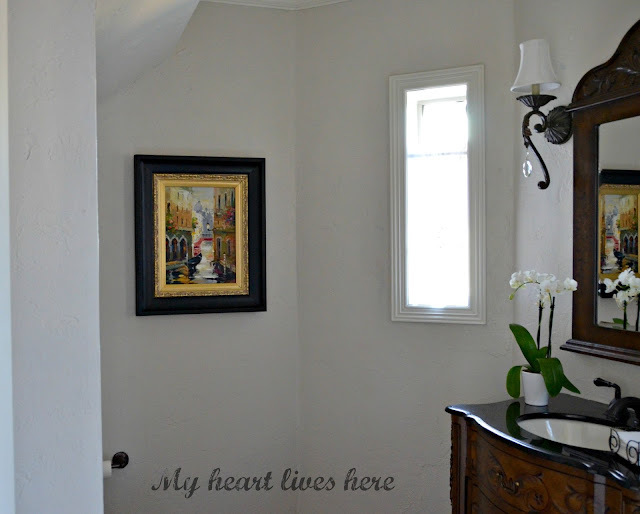 While I love the oil painting, I never thought the black frame looked right in our dining room. 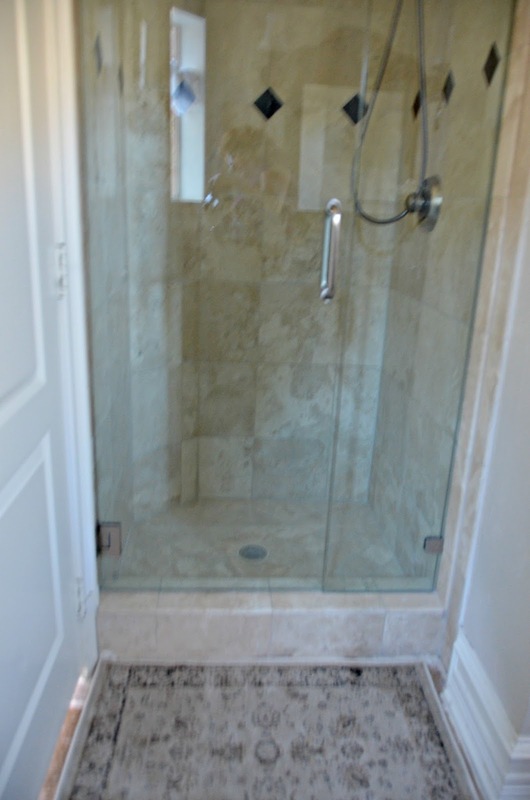 This little bathroom has black tile accents in the shower and a black counter top. The painting has found a new home in here. Now my little French bathroom is going to be a little Italian bathroom. I can live with that. P.S. If you haven't already, be sure to visit the great links at Monday Social. There is still time to join the party! Ellis, I love your Venice painting and it looks great in your bathroom. I just clicked on your link and saw the previous color. I'm loving your new light color! It makes a huge difference. I'm like you I need light. It does affect your energy level and mood. Pretty! The little painting is so nice. The frame looks great with the woodwork in there too. I know you must love your lighter paint colors. Perfecto! The black frame does fit with the bathroom's decor. Eilis, I love that painting in your bathroom. It is perfect. The colors look wonderful. Your bathroom has turned out gorgeous!! !